My good friend Aleister Kronos asked in his blog the other day for suggestions as to the top 5 innovations in SL. He came up with his top 5, & I came up with a few more. I've decided to write a series of blog articles on the various innovations. The challenge to fulfil is "Show me somewhere that represents the most innovative use of Second Life." Adam has worked with Mashup Islander to produce an amazing number of sculptures.... or perhaps the correct word should be "installations" within SL. Each of the works involves an interaction space, and a set of sounds - be they musical notes, or spoken word. Interacting with the sculpture causes it to make new and interesting sounds. Now some of these works could have been created in RL, but they would have been horrendously expensive, and actually quite dfficult to realise. Within SL, it is quite straightforward to script something that will drop balls when touched.... have the balls bounce off chimes on the sculpture, then have the balls disappear as they touch the ground. Falling balls can be achieved in RL, but not ones which disapear soon after use. Here's a picture I took of one of Adam's works on display in the Museum of Contemporary Art (MoCA) in the Neufreistadt sim. I had a rather excellent evening a while ago, visiting the sculpture park on Marni (Ramonia) with some friends. We were all able to fly through the work, triggering all sorts of interesting sounts....again, an act which would not be possible in RL. 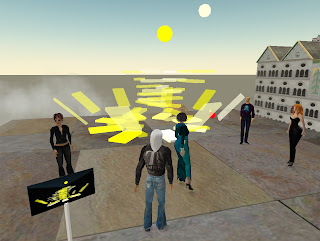 So there's my first example of innovation in SL.... a set of sculptures that react to the user; that could possibly be realised in RL, but which are far more accessible, interesting an FUN for beng created in SL.